These jewelry wires are made of durable copper; They are bendable, easy to make your crafts; And there are 5 colors of copper wires, and 1 color each roll, enough to meet your various needs. The flat nose pliers are helpful to form wire, wrap wire, open and close jump rings, close beading tips and attach findings; And the cutter pliers are useful to cut jewelry beading wire, hard temper wires. Jewelry pliers are made of good quality carbon steel and plastic; They are durable and sturdy with black rubber handles, easy and comfortable to grip. 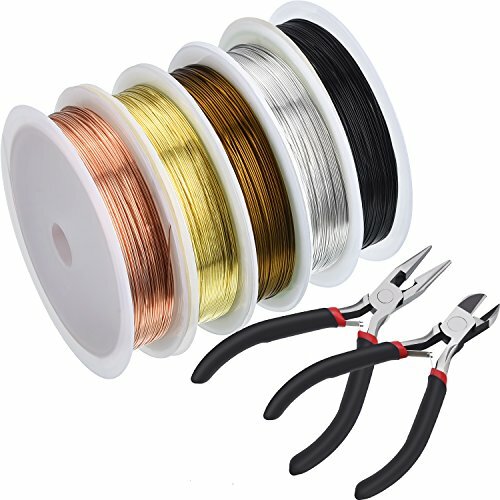 The copper wires are suitable for many kinds of crafts such as jewelry making, floral arranging, beading, home decorating, wrapping, and much more; And the package comes with a set of handy tools for you to make crafts easily. Making craft projects: they are good for jewelry making and other art crafts such as chain maille, beaded chain, bracelet, earring, necklaces, and wire wrapped pendants, floral arranging, beading, home decoration, wrapping, etc.